1 of 3 Heat oven to 375 degrees . In a medium bowl, whisk flour, baking soda and salt. Set aside. 2 of 3 In a large bowl, combine 1/2 cup of the granulated sugar, the dark brown sugar, butter and SunButter. Beat at medium speed until light and fluffy. Add egg and beat well. On low speed, beat in vanilla, followed by flour mixture, scraping down sides of bowl. 3 of 3 Place remaining 1/4 cup granulated sugar in a small bowl. Shape dough into 1-inch balls, roll in sugar and place 2 inches apart on baking sheets. Bake at 375 degrees for 8 to 10 minutes. 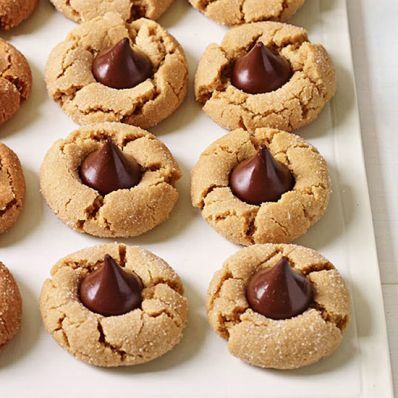 Immediately press a Kiss into each cookie. Transfer cookies to a wire rack and cool completely. Per Serving: 5 g Fat, total, 96 kcal cal., 1 g fiber, 12 g carb., 2 g sat. fat, 10 mg chol., 59 mg sodium, 1 g pro.